Dubai is set to open its 2nd and what is planned to be the World’s largest airport, Al Maktoum International Airport on June 27 2010 with the launch of freighter operations. With just 4 months to go before the opening, Dubai Airports is in advanced talks with airlines, both passenger and cargo, on every continent to start operations from the new airport. Al Maktoum airport is part of the $33 billion (Dh121.2bn) Dubai World Central development in Jebel Ali. 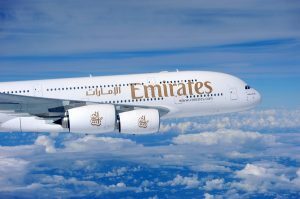 Paul Griffiths, CEO of Dubai Airports spoke to Emirates Business about the landings and take-offs at both Dubai Airport and Al Maktoum Airport during 2010. What is the progress with the new airport to be opened mid this year? It is coming along. We are getting the field ready for commissioning and we are pressing on with all the other facilities over there. We are on track so far for the June 27 opening. The airport will open for freighter operations initially. Passenger operations will follow at some stage in future. With the opening of the real landmark of Dubai World Central in June, we will be signalling the fact that Dubai Airports will now be a two-airport company and Dubai will be a two-airport city. So as growth starts to mature gradually over the years, we will start to see an impact across the system, of two airports rather than being focused on just one [airport]. We are expecting a gradual build-up for DWC because obviously, the main point at Dubai World Central is to work towards Phase 2 of Al Maktoum International Airport which will have a capacity for 160 million passengers, 5 runways and the airports of the future, which we expect to become operational sometime in early 2020. You said Al Maktoum Airport will begin freight operations on June 27th this year. Have you got any airlines confirmed for the same? We are talking to a number of airlines. Several of them have expressed interest. We have put a proposition to them and we hope to be able to make some announcements shortly as to who the initial airline operators will be. In November last year you mentioned that the first passenger airline will start operations from Al Maktoum Airport sometime in October 2010. Is that still the status? We are making things flexible. If you remember, when we opened Terminal 3 at Dubai Airport, one of the great successes of T3 was that instead of working to a date, we worked to a state of readiness. And the transition was perfect because everything was ready and then we announced the start date quite close to the initial date that we [had] started with. I think we are going to do the same here at Al Maktoum Airport with passenger operations where we obviously need to commission the passenger terminal building and get everything ready and make sure that it is fine. The freighter operation clearly will give us a good test of the operational facilities, the runway, the control tower and air traffic control. But we are not committing at this point in time to a definite date for passenger operations. But it will be at some stage in the future after the freighters have started operations. Have any passenger airlines signed up yet for Al Maktoum Airport? We have plenty of conversations going on at the moment and we are hopeful we will sign some agreements and get some people lined up pretty shortly. Normally airlines don’t plan that far in advance so we are trying to persuade them to give us commitments on their schedules. We are talking here about a full spectrum. We have talked to airlines pretty much on every continent. Will it make sense for airlines such as Flydubai to shift operations to Al Maktoum International Airport? Flydubai has of course invested a lot of time and effort in establishing its initial operations here at Dubai Airport. I am sure it will continue to be a strong contributor of growth. Whether they will decide to have some other operations at Dubai World Central in the future is a matter for them to decide. The real prize for us would be to attract some airlines that are new to the region. If we can persuade them to establish a base and operate from DWC, that will be an added feather in our cap. How many new airlines are expected to launch operations in Dubai this year? We had a turnover of approximately seven airlines last year. At present we have 130 airlines operating from Dubai Airport to 220 destinations. As for this year, we are still talking to a number of airlines. So far, we have got China Eastern Airlines. Are you on track to meet the 2010 target for passenger numbers at Dubai International Airport? I think so. We are looking at an overall 13.6 per cent increase for 2010 over the past year. If we have started the year with a 17 per cent increase for January alone, it does bode quite well for the future. We still have another 11 months to go, but the numbers for February are looking good and we hope to achieve double-digit growth. What challenges do you foresee for Dubai Airport in 2010? One of our key challenges is going to be capacity over the next few years. We are introducing IATA Level 3 Coordination from the beginning of April, which is a proper way of coordinating capacity and slots. A lot of the world’s busiest airports adopt that system where you apply for slots and get historic rights. We expect to operate that system to good effect and be able to schedule some new operations in and around peak seasons. We are going to face significant growth challenges at Dubai International Airport. Al Maktoum Airport’s initial capacity is about 7 million passengers, while our current capacity at the existing airport is about 60 million. When Concourse 3 is completed by the end of 2010, it will take the airport’s annual capacity to 75 million passengers. Between the two airports, we will have an initial combined capacity of 82 million passengers. Projections for growth over the next 10 years show that we will exceed that number quite comfortably. We could end up with 15 million more passengers than we can accommodate in terms of capacity. Because air travel and passenger traffic and freight traffic are such significant contributors to the economy in Dubai, we don’t want the constraint of airport capacity to stop that growth from being realised. My biggest challenge is how to meet growth and facility building programme and get the two to coincide because it takes longer to build facilities than to achieve growth. Do you reckon recovery has started in the aviation sector after the global economic slowdown? I think it is a little early to say, although freight traffic went up 31.5 per cent in January. Freight traffic is usually a good indicator of recovery – it is the first to drop when things start going bad and it is usually the first to lift when things start recovering. The January numbers are a positive indicator of the future. We are very encouraged by the January numbers and we hope that the trend will continue. Dubai Airport saw its passenger traffic climbing 17 per cent and cargo going up by 31.5 per cent in January compared to the same month in 2009. The airport plans to stick to its target of attracting 46 million passengers by the end of 2010, indicating a 13.6 per cent increase over 2009 passenger numbers. January saw 3.9 million passengers pass through Dubai Airport against 3.3 million in 2009, while freight volumes were up to 171.5 thousand tonnes, from 130.4 thousand tonnes a year ago.